Two panel doors or sides are handsome on their own; however, how do you bend them? I think it would make a great look for a small production clock I’m designing – but how to carry it off without bending wood?! I liked the Mission Style look that this piece add – with some added flair. While looking for some furniture ideas, my wife and I came across a cherry credenza with two-panel sides, seen here. Very handsome. What really caught my eye, both atheistically and technically, was that the two panel sides werecurved. Having made two-panel cabinet doors before, my mind immediately went about trying to understand how the craftsman carried off that little technical feat. The panels are usually made of thin plywood, to control expansion (among other reasons), and if they were steam-bent, seemed like quite a bit of work for production pieces. Not to mention this is suppose to be “Amish made” stuff, so you’d think all the technical stuff would be kept rather simple. I also happen to be looking for ideas for a small production clock for the Christmas season; something small, cheap, easy to make, and even easier to sell. I thought this curved side addition would be great – if I could pull it off without a lot of fuss. Woodworking and magic have some things in common; the principle one being making things seem like something they are not. Obviously, I couldn’t deconstruct and reverse engineer this piece, dang it, so I had to use my imagination – and Google’s Sketchup – to help me make it happen. Since my intended piece would be small – in the neighborhood of 6″ tall – bending was out. Also, trying to incorporate mortise and tenon joinery, as well as routing grooves in the stiles and rails was also out – too small, too much time. This is where the magic wand comes out. 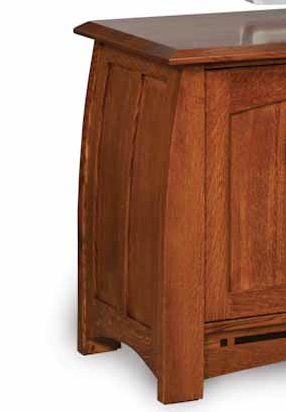 I happened to notice, when looking at the actual credenza, that the intersections where the rails and stiles meet the “panel” was tight – really tight. Master-craftsman-of-the-world tight. Looked awesome, of course, but not what you’d expect in a production piece. In other words, it looked too good. Eventually, I thought those panels might not be panels at all, but simply bandsawed stiles – only thinner. Look at the stiles – the very long pieces of the panel frame; theywould have to be bandsawed out of slightly thicker stock (if not steam bent from regular stock) to get that curve. Why not bandsaw the panels as well the same way, but out of (obviously) wider stock? When you put the pieces together, you get the curved panel effect shown here. You would then have to joint down the panels to make them look thinner then the stiles. When you look from the interior side, you’d have a flat surface. As shown in the last picture. Now this illustration was for cherry rail and stiles, with maple “panels”. If you were go with a single wood, perhaps just QSWO; then I believe you could actually simply cut one wide piece curved on the bandsaw, then cut that piece vertically into a stile, panel, stile, panel, stile, and then just joint down the “panels” an eighth or quarter inch to get that recessed panel look. I think it would be a very nice look. So, that’s the idea – a theory – on how to make these curved 2-panel doors. In my next installment, I’ll report on how I did on a trial run of this theory!